On Wednesday 4/24, Zach Pine will lead Pre-jam Skills, Exercises, and Explorations class from 9:30am-10:30am. The theme is “Time and Distance.” All levels of experience welcomed and engaged! Full scholarships available, thanks to Athletic Playground. $10 from 9:30am onwards for drop-in. Reduced rates available for multiple drop-ins to Open Play/Jam time (free for Athletic Playground Members). you are invited to join our playful, friendly, safe, and inclusive gathering from 9:30 am onwards. Please read our Community Agreements. After a brief group warmup, learn (or deepen your understanding of) contact improvisation skills, and put those skills into action with exercises and explorations. All levels of experience welcomed and engaged! Opening circle at 10:30 is followed by a different brief group opening score each week, then open jam with a closing circle at the end to harvest the fruits of our experiences. Some have asked: "what exactly does 'playful" mean" or "Why call it 'playful jam' and not just 'jam'?" 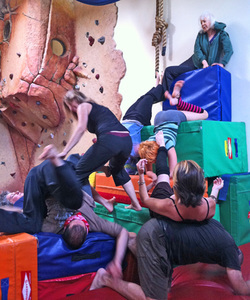 The answer: recognizing that any contact improvisation jam can include playful qualities, we carry out an intention for extra, pervasive spirit of play in this jam. We often make "playscapes" using big gymnastics blocks, and incorporate "toys" like balls and hoops in our jam. This gathering takes place during "Open Play" time at the Athletic Playground. There is free off street parking available in the lot adjacent to the Playground, and free street parking nearby. Wheelchair accessible venue and restrooms, however, occasionally we have to relocate to the non-accessible upstairs studio, and we note that in the "News" box at the top of this page. Please no scents. All ages are welcome.